Panasonic is claiming the AF speed of its new micro system Lumix DMC-GH2 is faster even than a top end phase detection DSLR. With the read rate of the newly developed contrast detection system increased from 60fps (GH1) to 120fps for the GH2, the company says the camera will find focus in 0.1 seconds with an accuracy that u2018exceeds by faru2019 that of a DSLR camera. Panasonic is claiming the AF speed of its new micro system Lumix DMC-GH2 is faster even than a top end phase detection DSLR. With the read rate of the newly developed contrast detection system increased from 60fps (GH1) to 120fps for the GH2, the company says the camera will find focus in 0.1 seconds with an accuracy that ?exceeds by far? that of a DSLR camera. The Panasonic Lumix DMC-GH2 is the second generation Lumix GH model designed to offer superior movie shooting modes. The new camera has a 16.05 million pixel Live MOS sensor with maximum dimensions of 4976×3456 pixels via a range of different aspect ratio options ? in 4:3 mode images measure 4608×3456 pixels. The camera offers JPEG and raw formats, as well as the MPO 3D file format. This will be the first Panasonic camera to be compatible with the company?s new 3D lens, though it will only work in stills mode and offers side-by-side 1920×1440 pixel images as well as a normal JPEG captured simultaneously. Despite the extra pixels over the GH2?s 12-million-pixel predecessor, the new camera is said to produce much less image noise. A new processor that incorporates three CPUs and a newly design sensor structure, that features less wiring, have improved the signal to noise ratio by 3dB and have allowed the sensitivity of the sensor to be increased by 200% over the last model. A new highest ISO setting has been introduced, which at ISO 12,800 is a 2-stop improvement, while the maximum burst rate has been boosted from 3fps to 5fps. Panasonic is especially proud of the new model?s movie shooting abilities. 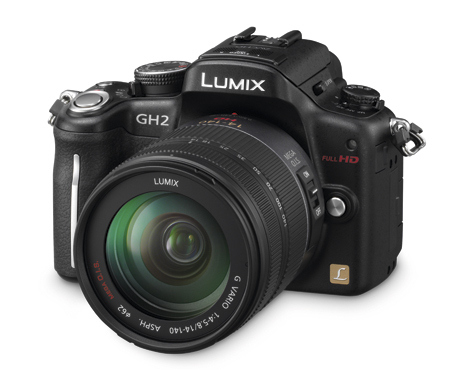 Capturing in Full HD 1920×1080 resolution, the GH2 allows frame rates from 25-50fps (in Europe), as well as a Cinema mode that shoots 1080/24p. Picture compression is claimed to be particularly low, with a bit rate of 24Mbps. A further new feature is the live output mini-HDMI socket that allows the camera to stream footage directly to an external monitor. The 3in 460k-dot vari-angle rear-mounted LCD screen is equipped with touch-shutter technology, and provides the means to select the position and size of the AF zone on screen. As the camera detects the type of subject being photographed ? portrait, landscape etc ? it alters the exposure and processing modes to suit. When working in manual focus mode, the screen offers magnification of up to 10x. Panasonic also claims this new screen features a 40% wider colour gamut than previous units. Colour drag (the rainbow effect around moving edges) in the electronic viewfinder has been reduced by half, by increasing the refresh rate of the 1,530,000-dot 0.71x magnification screen to 60fps. While pricing has yet to be agreed Panasonic has told AP that a kit with the 14-140mm lens will not cost more than the same kit did when the GH1 was released.